Life has taken such a monumental turn for me these past few months. I have seen another continent and moved out of my hometown. I am currently unemployed and get to spend my days cooking, reading, walking, and googling cats on the internet. Life is beautiful. No, you make me laugh! 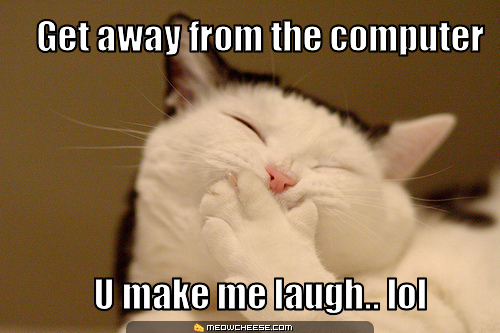 Shut up lolcat! So let me just make it clear that when I say I miss Ann Arbor, I don’t mean I’m unhappy here. Quite the opposite. There are, of course, plenty of things that are different enough to notice and take issue with, like the traffic (oh, the traffic). Suffice it to say I’ve been honked at and wanted to honk back more times in the past month than I ever have in my life. But let’s not talk about the traffic. It’s not like I miss Ann Arbor’s traffic. What I miss is Ann Arbor’s food. Specifically, getting to the food. Where I used to live, I could walk for five minutes and be within a block of multiple award-winning restaurants, and get served by someone I likely knew by name. Here, I have to drive for half an hour (through traffic) before I’m in a neighborhood where I can find a decent bite to eat. I live in the suburbs, man, and it’s kind of a drag. I find myself jonesing for some Earthen Jar or Zola more often than I care to admit. Most of all, though, I miss Jerusalem Garden. I used to eat there all the time when I worked at the Michigan Theater. We would call over an order and someone would volunteer to walk and pick it up. 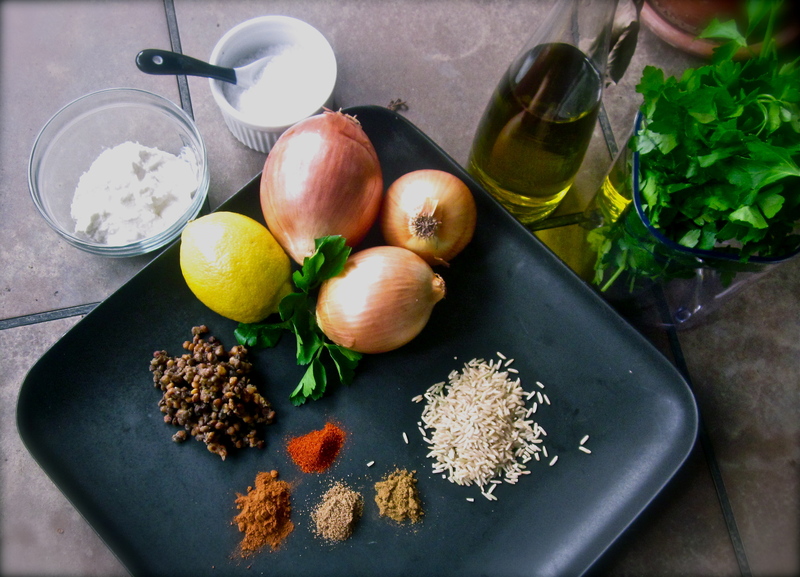 The rice pilaf was amazing, but with my falafel I always chose the Mjaddara. If you’ve never tasted this Lebanese delicacy, maybe it’s time to try it. 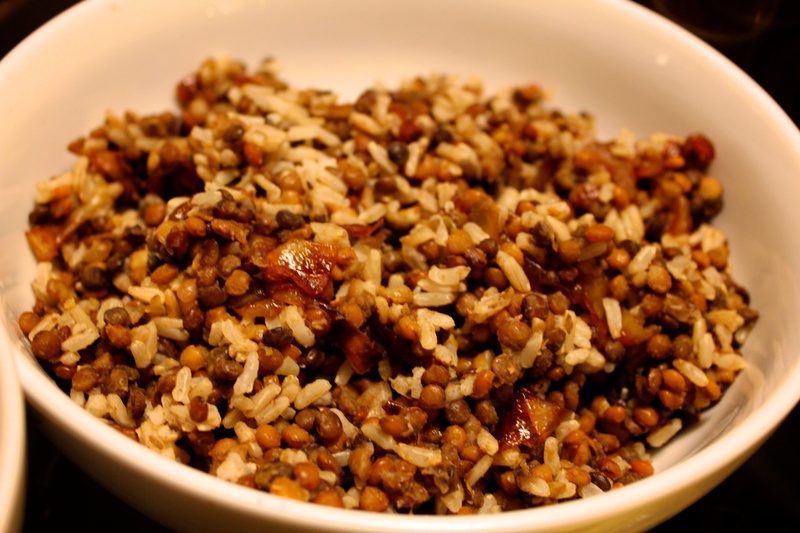 Caramelized and charred onions married with soft lentils and barely spiced rice. It is the perfect combination of textures, both sweet and savory, unfussy to prepare, and it complements a spicy, salty main dish perfectly. Those of you in Ann Arbor might choose to walk to Jerusalem Garden (lucky ducks) but this girl had to be content to make her own version. Personally, I think the yogurt sauce takes this to the next level. Let’s just say my craving was more than satisfied. Note: Here’s a dish that will come together in a flash. It takes a while to caramelize the onions, but it’s largely unattended cooking. And the rice and lentils can both be made ahead and then slowly warmed up. I recommend making the yogurt sauce as early as possible in your preparation—the spices mellow together much better then longer it sits. If you are vegan, leave out the butter and skip the yogurt sauce–try adding some spices to the finished dish if you like, though it’s great plain too! First, the yogurt: mix all the ingredients together in your small bowl. It may taste pretty spicy, but it will mellow as it sits. 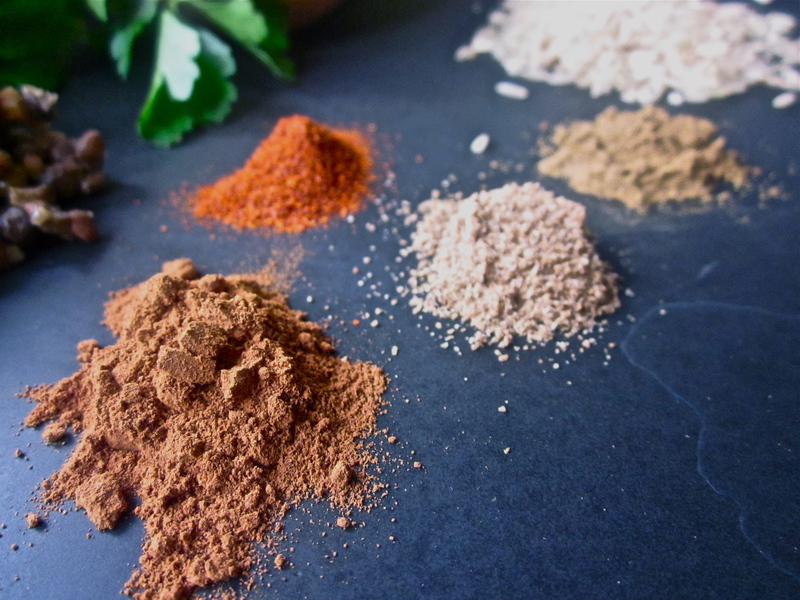 Keep it in the refrigerator while you get the rest of your ingredients together. Now, the Mjaddara: Put the butter and olive oil in your deep sauté pan over medium-low heat. When the butter melts, add the onions and stir frequently for about five minutes until they soften a bit and the layers break apart. Reduce the heat to low and keep stirring every minute or so. You want them to cook slowly, brown but not burn. Sprinkle them with a little salt and let them cook for 30 minutes to an hour (keeping an eye out and stirring when necessary) while you make the rest of the meal. If you find that they are drying out quite a lot, add a little water, a tablespoon at a time, and reduce the heat a bit. Meanwhile, put the rice in one of your saucepans and add about 2¼ cups water and ½ teaspoon of salt. Bring it all to a boil, reduce the heat to low, and cover. If you’re using a rice cooker, follow the instructions for your machine. It should take about 30-40 minutes. Lentils go in your saucepan with about a quart of water and a big pinch of salt. Bring to a boil, reduce heat to low, and cook for 20 minutes. While these cook, your rice should be getting close to done and the onions should be nice and translucent. When the lentils are soft but not mushy, drain them and dump them into your big bowl. When the onions are a beautiful deep brown and taste soft and sweet, turn the heat up to medium and let the onions get a bit crusty on the bottom. Don’t stir them, just char them a little for about three minutes. Scrape the contents of the pan into the bowl with the lentils and add the cooked rice. Mix it all together. It only gets better the longer you let it sit, so don’t worry about taking it right to the table. Garnish with parsley sprigs, give the yogurt a final stir and taste for seasoning, and serve. Hi again! Those of us still in Ann Arbor last summer we lucky to even GET to Jerusalem Garden due to construction, but the effort was well worth it! Hopefully they’ve opened up Fifth again since I’ve been there. 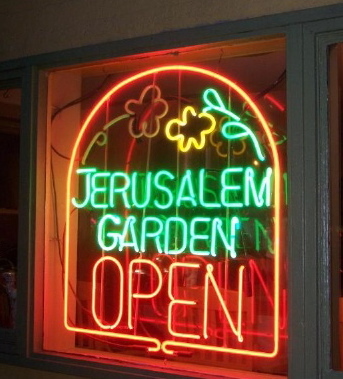 Anyway, here is a link to another food blog–written by another fabulous local Ann Arborite!–reviewing more delicious foods from Jerusalem Garden (and yes I do get a cameo appearance in the post): http://foodfloozie.blogspot.com/2011/07/frugal-floozie-friday-jerusalem-garden.html. More of her recipes and blog postings available at annarbor.com.